Prince Hashim, the half-brother of Jordan's King Abdullah II, married a Saudi woman, the official Petra news agency reported. Hashim, 25, is the son of the late King Hussein and American-born Lisa Halaby, who took the name of Queen Noor when she converted to Islam upon her marriage on June 15, 1978. Hussein died of cancer in February 1999. Abdullah hosted a luncheon banquet in honor of Hashim and his bride, Fahdah Mohammed Abu Neyan, Petra said. The family celebrated the nuptials under a tent pitched on an outdoor lot in an Amman hilltop compound housing several royal palaces. No details were released on the bride, apparently to maintain privacy on royal family matters. The couple were engaged last January. Petra quoted the Jordanian monarch addressing an unspecified number of guests at luncheon. It said they were , but gave no further details. "I'm very pleased to be with you on this blessed day," Abdullah told the guests, according to Petra. Attendees included Jordanians, Saudis and Omanis, the news agency said, but did not give the number of guests. 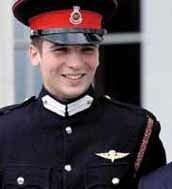 Hashim, like many members of the royal family, is a graduate of Britain's Royal Military Academy, Sandhurst. He also attended schools in Boston and Washington, D.C. He holds the rank of captain in the Jordanian armed forces, but has no post in the government. Hashim is the name of the Prophet Muhammad's grandfather and the founder of the Hashemite dynasty to which the royal Jordanian family belongs, reports AP.